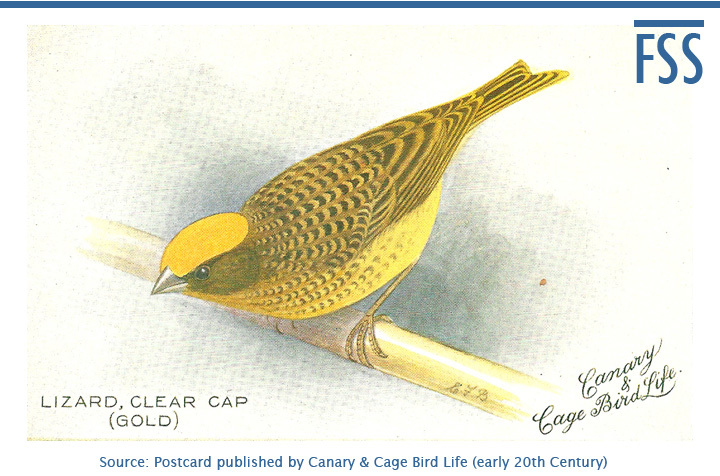 It might seem strange that I should return to the subject of the cap, not long having discussed the various forms of cap in some detail, but that is the nature of the Lizard canary: you can never stop looking and learning. This time, I’m going to look at the cap we should all be striving to create: the ideal. That might seem clear enough, but as any lawyer will tell you: you might think you know the law; it’s how a judge interprets it that matters. The first thing to point out is that the LCA’s definition is at odds with historical descriptions of the perfect cap. Let’s compare it with the descriptions given by two Victorian authorities: R.L. Wallace (The Canary Book, 1875) and W. Blakston (Canaries and Cage Birds, 1878-81). LCA: “the head is fairly large, round and full at the top”. Wallace: “the head must be full, broad and flattish on the crown”. Blakston: no written comment, but the illustrations show a bird with a flattish crown. LCA: “the cap extends from the base of the upper mandible”. Wallace: “the cap . . . ought to terminate at the top of the bill”. Blakston: “a perfect cap should be bounded by a line commencing at the top of the beak”. “What is recognised as an oval cap sometimes appears narrow, and detracts from the positive width of the back of the head, especially if the oval be at all pointed; while the ‘thumbnail’, which in its most perfect form is bounded in the rear by a curved and not a mathematically straight line, and is in reality one form of ellipse, fills the eye. This cap now occupies that place in our allegiance we were one time disposed to give to a pure oval”. Claude St. John in Our Canaries (1911) goes even further and makes no mention of an oval cap at all. He tells us that “the edges should be even and well-defined, and the whole cap somewhat similar in shape to a man’s thumb”. While I agree that a full thumbnail shape is better than a narrow oval, it is quite clear from the LCA standard that the oval cap should be given precedence provided everything else is of equal merit. Now we come to the termination of the cap, the location of which everyone seems to agree: the base of the skull. There is a little problem however: the base of the skull is not where people assume it is. Have a look at my drawing of a canary skull and you will see that it is far lower than you might think. What people really mean is not the base, but the back of the skull. Even that is difficult to define because it is a zone rather than a point. Add a layer of feathers and a bird in constant motion, and I defy anyone to tell me exactly where that point is. Things get even more confused when you see old illustrations of the Lizard canary that show a cap reaching down to the neck. Even the LCA’s newsletter, Lizard News, has been guilty of this in the past. As a result you see Lizards at some shows with beautifully shaped caps that are 6mm too long. Sometimes more than that! If you look to Blakston’s masterpiece for guidance, you will find detailed illustrations of a short-capped bird and an over-capped bird, but an illustration showing a cap of the ideal length is strangely absent. All I can do is to interpolate between the two and give you my interpretation of what Blakston implied. I can imagine that some readers will think it is a little small, but that is an illusion because a) the bird has a flat crown and b) the head is drawn from the side. When viewed from above (as in the coloured picture from Canary & Cage Bird Life) it looks fine. Wallace doesn’t go into the same detail, but he endorses Blakston’s assessment through his description of the winner of the Crystal Palace Show of 1875. This was the equivalent of the National Exhibition in Victorian times. Wallace tells us it won with ‘the most consummate ease’, and amongst its many ‘grand’ features was the cap. Note that this bird was drawn from life; it is not the result of an artist’s imagination; and we can therefore believe what we see. Confused? All I can do is suggest the method how I, and many other breeders and judges, assess the length of the cap. A good guide is to draw a line from the centre of the beak, through the eye, to a point at the back of the head. The advantage of this guideline is that you can still gauge that point even if the bird tilts its head. In practice, a Lizard canary rarely holds its head still long enough for you to draw that line, so some latitude has to be allowed; perhaps a tolerance of +/- 3mm. That’s as close as most people can get, and that applies to both breeders and judges. Incidentally, this imaginary line is also very useful in assessing the length of a broken cap Lizard’s cap, when the light feathers are at the back of the head. Some sharp-eyed readers will have noticed that I have not mentioned the non-cap, even though the LCA standard says that it can attain the full ten points for the cap. Rightly so, because a total non cap should always beat an imperfect clear cap, all else being equal. However, there is no doubt that if a Lizard with a perfect clear cap came up against a perfect non cap for Best in Show, the former should win. Why? Because the classic Lizard canary is a bird with a cap. For most of its history only clear capped birds were eligible at shows, and although we take a more liberal view now, the capped bird should take precedence. It is one thing to describe an ideal, but achieving it in real life is much more difficult. Salvador Dali was right, and that is why I chose to head this article with a drawing of a Lizard canary rather than a photograph. That’s the closest to perfection that I can get. I introduced Part 4 with the words “The Lizard’s cap: a tiny patch of feathers that generates acres of newsprint.” With the addition of Part 5, I have written almost 2,300 words, produced twenty illustrations, and still haven’t exhausted the subject.